Its undoubtedly tedious and tricky to build an interactive user interfaces with any of the development platforms. It requires tireless effort to develop each component of a website, you will find that complete dedication and proper concentration in our skilled developers. We being one of the best eCommerce Web Development Company India, recommend you to hire ReactJS developers. Across the market, you may find many of the web developers who have gained specialization in different domains. But, here we recommend you to get the best ReactJS developer. We promise you to deliver up to the mark ReactJS development services for your ongoing and upcoming projects. Please read on to know more about the blissful features and benefits of this framework. 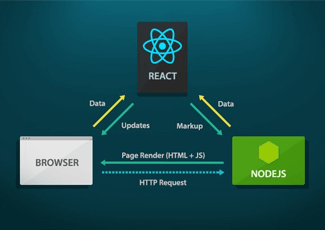 Also, you will find out the different reasons which proves ReactJS to be a reliable option for the development of web application. ReactJS is an extremely easy framework to work with and gives out interactivity to the layout of any UI. Also, it provides quality assured and fast application development to save the valuable time of the clients as well as developers. ReactJS helps significant data changes which in turn results in an automatic modification in the selected parts of the User Interfaces. Due to this beneficial functionality you don’t need to perform any additional functions to update your user interfaces. Reusability is exactly like a magic bullet for developers. With ReactJS, developers have the authority to reuse the components build for any other application having the same functionality. It reduces the development efforts and ensures the components perform relentlessly. As ReactJS is so much easy, it includes flawless usage of the Document Object Model(DOM). But, it does not use the browser but allows developers to change the current DOM version available in the memory. With this functionality, the performance of the applications will easily gets enhanced. Matebiz is a leading ecommerce development company in india, We are capable to delivering customized eCommerce website design & development solutions on well-known eCommerce platforms like Prestashop, Magento, OSCommerce, VirtueMart, Zencart, Opencart, Ubercart, Woocommerce, BigCommerce, Shopify etc.